Jo Bowen-Jones has worked with animals for the past 17 years, and has been grooming dogs for 13 years. She moved to Kempshott in February 2012 after running a very successful grooming parlour in South West London for 11 years. With a wide range of skills and experience plus an endless supply of patience and good humour, Jo is well equipped to deal with the most challenging situations, turning doggie disasters into well-groomed paragons. 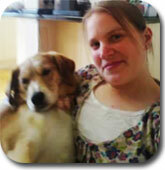 Having worked in dog rescue centres she is used to dealing with nervous dogs. She will work with you to achieve the best result for your dog, offering advice where needed and treating each canine client as an individual.